Guest post By: Stefanie Whitmire, Ph.D., Research Scientist at the Baruch Institute of Coastal Ecology & Forest Science, Clemson University June 30, 2017 - Microplastics are plastic pieces measuring less than five millimeters in size and in recent decades, there have been many studies that indicate a strong presence of this type of debris in marine and coastal environments. Microplastics can come from a variety of sources. Some microplastics are manufactured at that small size as microbeads, found in products like toothpaste and facial scrubs, or pellets, which are used to make larger plastic items. Microfibers, another type of microplastic debris, come from synthetic items such as rope or clothing (like fleece). Microplastics also come from the breakdown of larger plastic pieces, such as water bottles and fishing line. Unfortunately, the presence of microplastics in the marine environment poses risks to wildlife. Microplastics ingested by animals can physically damage the digestive tract and potentially expose the animal to chemicals and contaminants associated with the microplastic particle. 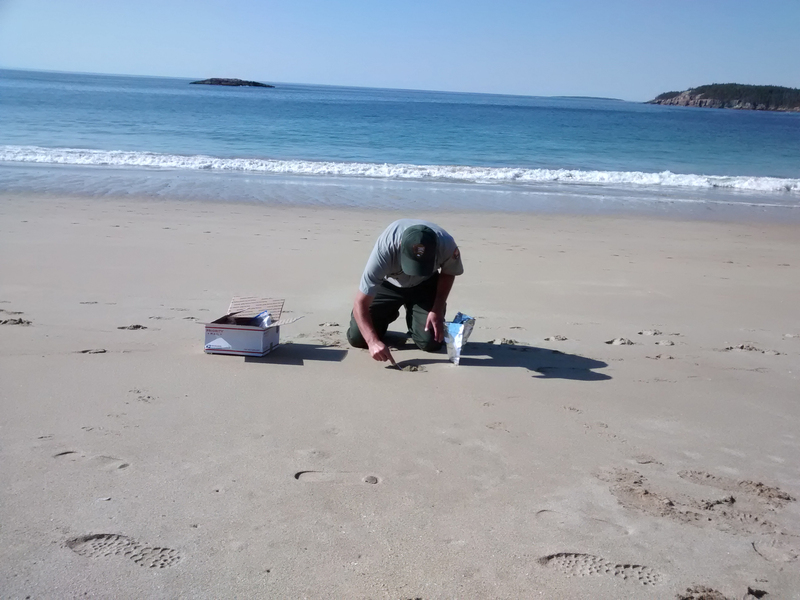 To investigate the number and distribution of microplastics on National Park beaches across the United States, researchers at Clemson University collaborated with the National Park Service to collect and analyze sand from 37 coastal National Parks. The study area included parks from the Northeast, Midwest (Great Lakes), West Coast, Alaska, and Pacific Islands. This collaborative effort, funded by the NOAA Marine Debris Program, provided a unique opportunity to quantify microplastic loads from a wide geographic distribution of coastal beaches, capturing a snapshot of microplastics around the country at one moment in time. Most of the microplastics that were found in this study were in the form of fibers, but beads and plastic fragments were also observed (see microscope images below). The presence of microplastic debris was widespread and found at even the most remote areas, such as secluded parts of Alaska, but the highest recorded amounts of microplastics were at individual parks in the Great Lakes and the Pacific Islands. Interestingly, many sampled sites were far from urban centers but still had over 100 pieces of microplastics per kilogram of sand. This was observed in Alaska, along the northwest Pacific coastline, and the islands in the Pacific. However, no clear patterns between quantity of microplastics and geographic features like urban centers or rivers were apparent. This was not completely unexpected given the wide geographic sampling and the numerous local factors that could influence microplastic abundance along these shorelines. For instance, beaches can capture microplastics from both open water bodies (the ocean or lakes) and riverine systems. Additionally, beaches are dynamic systems, with constant movement of sand and other particles like shells, glass, and plastic. Understanding the movement and turnover of microplastics in beach environments will help us clarify the exposure and risk to wildlife in the future. Overall, this project provided a snapshot of microplastics around the United States and emphasized the pervasive nature of this type of marine debris. Check out the final report, Quantification of Microplastics on National Park Beaches, for more information on this project. This guest post firs appeared on the Marine Debris Program’s blog, visit that blog to read the complete post. 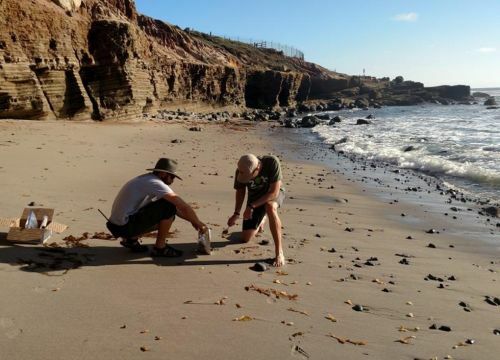 National Park Service staff collect sand for microplastic and microfiber sampling at Cabrillo National Monument, California. Image credit: NPS, Cabrillo National Monument.